I think it appropriate to kick-start this blog by debunking some surprisingly common myths about the wondrous world of bees. While out on the trails conducting bee surveys here in California, I often run into hikers who, upon seeing me and my intern walking with large mesh insect nets, usually exclaim something like “Wow! Are you collecting butterflies?” Once we explain to them that, no, in fact we are doing biodiversity surveys for bees, they usually follow with some variation on “Great! I love honey!” or even occasionally “Oh, I hate bees! They sting me!” Depending on how pressed for time we are to arrive at our next sampling location, I then try to spend a few minutes pulling aside the curtain on the real world of native, solitary, (mostly) non-aggressive bees to give them a glimpse of the insect complexity that gives rise to a diverse array of wildflowers and shockingly little honey. The result is usually one of appreciative awe that makes me want to grab every hiker I see on the trail and show them the delicate contents of my net. I love honey too. It is my sweetener of choice for tea, oatmeal, and warmed tortillas (yum…). I am certainly not immune to the intrigue of the altruistic societies and wiggling communications of the honey bees, the subject of a devoted middle school research paper of mine. I still consider it a high point of my life when I took my eighth grade science fair project on the antioxidant content of honey of various nectar sources to the Colorado State Science Fair and won third place overall in the Physical Sciences category. In fact, it’s a little embarrassing to admit, but I included a picture of me in knee-high socks and penny loafers, sporting my third place ribbon in front of my cardboard project display in my application to graduate school. My point is: I’m not here to knock honey bees. But it’s a tragedy that their enchanting wiggle dances, painful stings, and penchant for sweet, sticky liquids to get them through the winter is all the word “bee” means to most people. It is just the beginning, my friend. 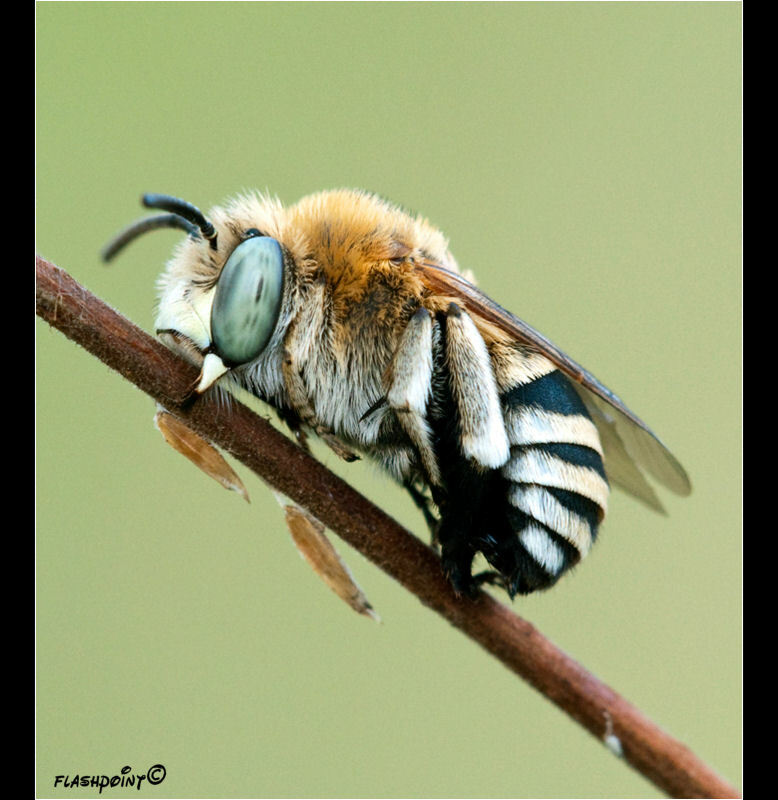 Or rather, it’s the end since social bee behavior evolved from the multitudes of solitary bees. So it is actually the vast and important beginnings we are missing. Let’s get to it. Maybe you have heard that there are over 20,000 known species of bees in the world? (I got that off of a fact card I wrote for my middle school research paper—why I still have those cards is more difficult to explain.) Honey bees are approximately nine of those species, so we can just pretend they don’t even count. Can you even imagine 20,000 different types of bees? Take a minute. 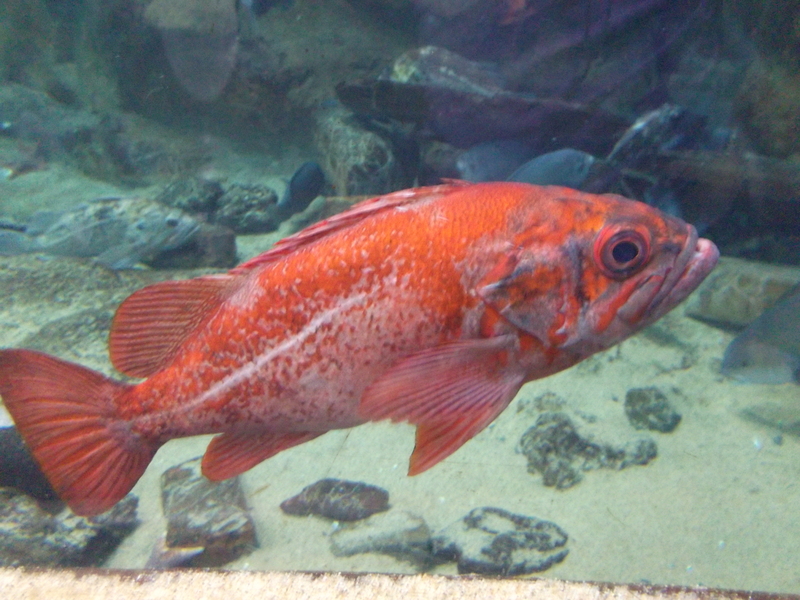 To be fair, some of the different species are visually indistinguishable except to a few very diligent experts with expensive microscopes. But there is still almost unfathomable morphological variety in the fuzzy Hymenopteran pollinators zooming around our planet right now. There are bees that are an inch long and completely black, even to the tips of their powerful wings. There are bees that are so small we have to use the tiniest dab of Elmer’s glue to attach them to a pin or a point (piece of paper that is then pinned) for display since running even the thinnest metal pin through their mesosoma would split the bee right down the middle. 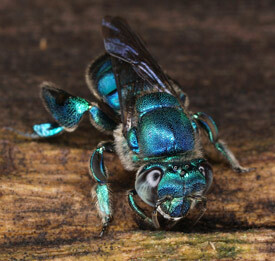 Some bees are bright metallic green with red-tipped abdomens, some are a dull shiny blue, and some display a rainbow of bright colors cascading down their bodies (when I first saw a museum specimen of this type, I have to admit, I wanted to steal it). There are also, of course, some bees that are orange or yellow with black abdominal stripes. Morphological variety often signifies behavioral variety, and among these 20,000 different kinds of bees there are as yet innumerable pollination strategies and specific floral preferences. Fortunately for herbivores and wildflower lovers alike, this has directly resulted in (and been the result of) the evolution of an incredible modern variety of angiosperms, the flowering plants. This mutualism between bees and flowers, each adapting in shape and seasonality to one another over millions of years, is one of the most classic, dominant, and elegant examples of co-evolution on Earth. 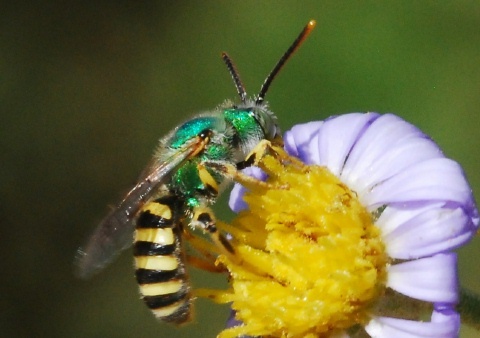 For example, the anatomy of certain orchid flowers is such that when an Orchid bee squeezes through a tailor-made passageway en route to floral nectar or scents, it causes part of the flower to bend down and affix a pollen packet (pollinia) to the backside of the bee in such a particular place that it cannot be removed until the bee squeezes through another Orchid of the same species, completing pollen delivery between the two flowers. Some bees in New Zealand have adapted to be able to access the nectar and pollen of certain flowers by biting and pushing open flower buds that are unable to open themselves. But the behavioral variety among bees doesn’t stop with floral interactions. 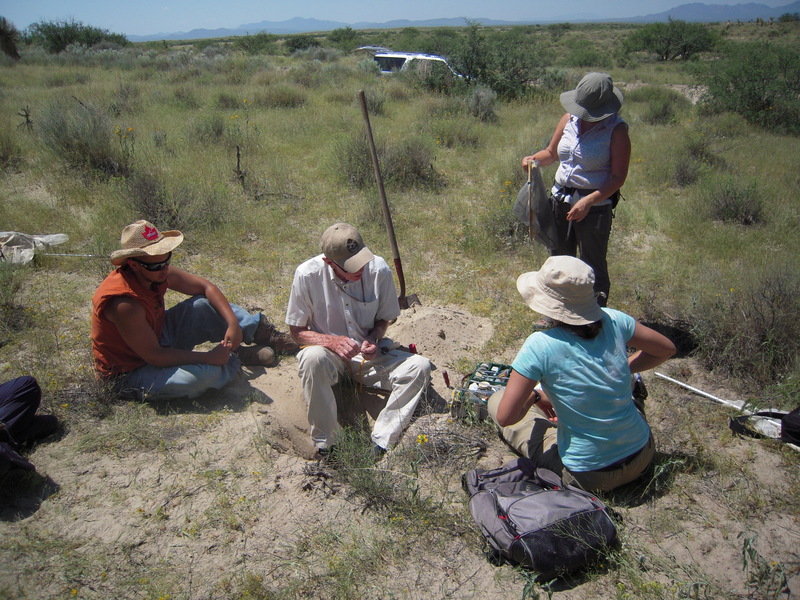 Last August in southern Arizona, I watched bee expert Jerry Rozen spend over an hour patiently puffing away tiny clumps of sand with a reverse aspirator to reveal the thin, almost meter-long tunnel descending to the nest of a particular solitary bee mother. At the bottom we found a delicate little pill-capsule-shaped case made of meticulously cut leaf pieces, pasted together to enclose a single egg, and a hard-won lump of pollen and nectar. The effort this single mother had expended in her short (3-5 week) life to collect this food and nest material, and to slowly excavate such a deep cavity in which to keep it safe makes the Egyptian pyramids look like a slop job. Other bees are known to use multi-colored pieces of flower petals to construct their egg cases, making tiny works of art more precious than most bearing price tags, in my opinion. Some bees laboriously tunnel into wood to make their homes, or camp out stealthily in the hollowed-out stems of their favorite host plants. There are also bees that, while declining to actually work together in creating a hive and dividing up the tasks of rearing young, are not as hermitic as some of their ancestors. Some bees live in “apartment style” dwellings, each mother master of her own nest domain, but sharing a common entryway and hallway. This allows for some shared labor in tunneling out the main passageway and provides a “neighborhood watch” type of security against parasites lurking to pounce when the mothers heads out to forage. Dr. Rozen may never be able to retire his aspirator with the wonders of bee nest-building that are yet to be discovered. 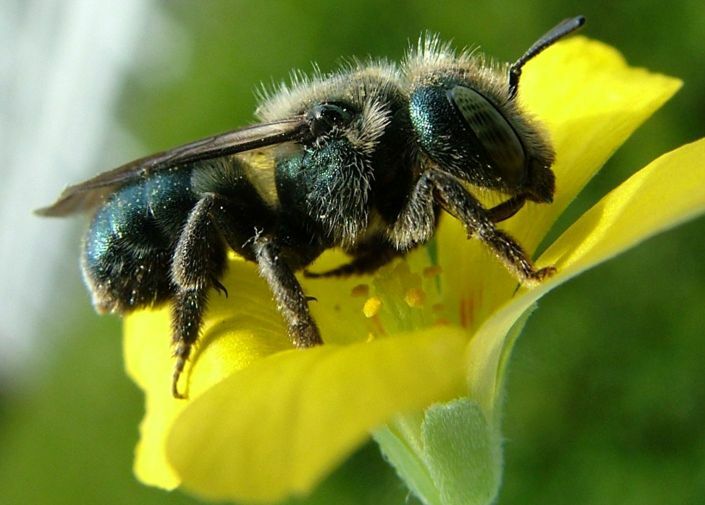 What all this solitary, hidden bee nesting means for most of you is that the vast majority of bees actually have no interest whatsoever in stinging you. So you should not hate nor fear them. 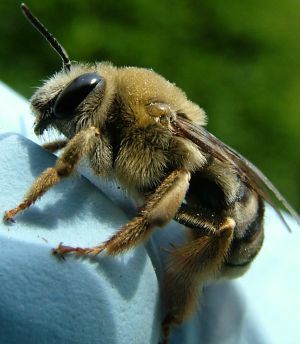 With no grand hive to guard, and each solitary bee mother working exclusively in her own self interest with her young in mind, she is very unlikely to charge and impale you at the cost of her own life. Among the social bees who do live in hives, one major group is actually known as the “stingless bees,” and therefore cannot do you any harm while crusading for their hive. In fact, there are many species of bees who don’t even have the ability to sting or whose stings serve only as endearing, pin-prick reminders that we are Goliath here. And since the stinging apparatus is a modified egg-laying organ and therefore only present in females, male aggression is not something you need concern yourself with in bees. I know melittologists (bee researchers) who, when they recognize a long-antennaed male bee in their net, go ahead and pluck it out with their fingers, so confident are they in its inability to inflict any harm. (Most of the time their assessments are correct, but an occasional misidentification can come with a painful admonishment.) So frolic in the meadows at will and feel free to enjoy the pollinating insects you observe at close range. You’ll know a honey bee when you see or hear one and it probably won’t want to sting you and eviscerate itself either as it heads off over the hills, laden with the pollen of a hundred flower visits. And just so we’re clear on one more thing: Yellow-jackets? They are wasps: the mostly predatory, hairless, thin-waisted, devious cousins of bees. So I make no excuses for their painful stings. Just look twice in your soda can before you take another drink. Digging up a bee nest in southern Arizona. 105 degrees out! I think that wraps up the first installment of bee basics. If I see you out on the trail, I’ll net you a few bees and show you how friendly and interesting and fuzzily cute (on par with puppies and baby seals, I’d say) they can be(e). And then we can talk about how much we all like honey. This entry was posted in Bees, Native bees and tagged Bee, California, Flower, Honey bee, Hymenoptera. Bookmark the permalink. 4 Responses to Newsflash: Not All Bees Make Honey! This might be an overly simplistic question, but are all bees pollinators? You seem to imply, but never actually say, that they are. Good question! As a whole, we appreciate bees as pollinators, and most probably are to some degree. But there are many species whose true effectiveness as pollinators has never been evaluated. Floral specialists might be better pollinators than generalists, who will end up scattering pollen around rather than delivering it to conspecific flowers. Some bees are so good at packing away the pollen they collect (often mixing it with nectar and “wet-packing” it) that they don’t lose much on subsequent flowers, resulting in poor pollination, while others collect pollen by ingesting it, removing it from the floral network. Under some circumstances, bees will actually collect previously deposited pollen off of floral anthers, reversing pollination. Finally, there are some bees who are cleptoparasites on other bees’ nests and don’t pollinate at all. You can often tell them by their relative lack of hair (which they don’t need since they don’t collect their own pollen)! As an interesting side note, while most wasps are carnivorous, some are pollinators since they rely on pollen for protein and end up distributing it while collecting.